Pacific Mood Geometric shapes, natural materials, and shoji screens set the scene in this Zen-inspired master bath. Materials with an organic feel--bamboo flooring, concrete vanity top, granite tiles--bring elements into harmony. The vanity, with pullout drawers for hidden storage, is made of a renewable rainforest wood. The almost-transparent shower features two showerheads with hand spray and thermostatic valves as well as a boxy bench. 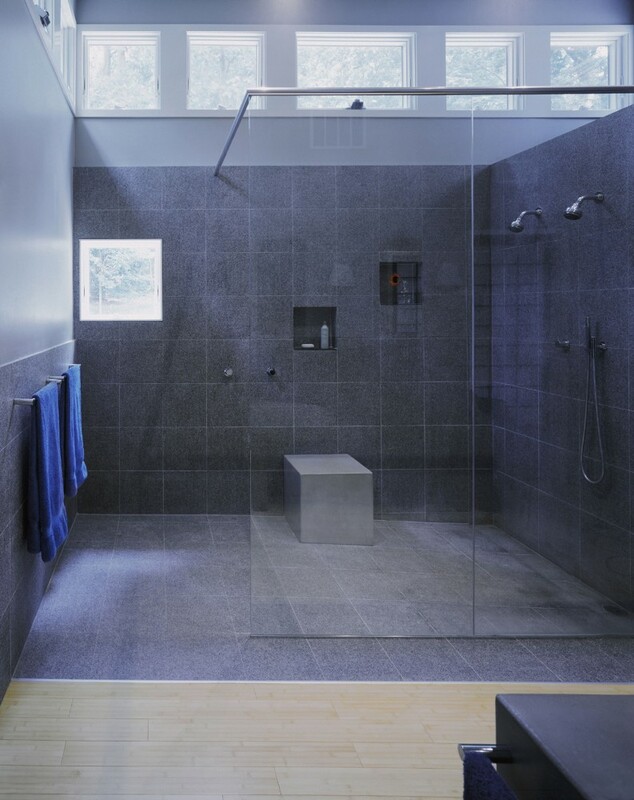 Carefully aligned floor finishes and a slight pitch make the curbless shower possible. A row of remote-controlled clerestory windows wrap around the shower wall, flooding the stall and adjacent toilet area with light.